Let me start by saying each region, town and even household seems to have its own special version of dinuguan. This is an important starting point, because I don’t want to declare one better than the other, or one more authentic than the other. I have read over a dozen recipes for dinuguan in preparation for the next few posts, and reviewed reader comments on previous posts to get a feel for the variety of ways it is prepared. Historically, I like the logic behind the explanation that the chieftains, hacienderos, merchants and other leaders of society were likely to be the ones to fork out the big bucks for a lechon, but it was the “back of the house” or workers who ended up with the offal or innards. As such, each household made do with whatever ingredients and resources they had, to come up with a tasty and now iconic stew of pig’s innards in blood sauce… dinuguan. 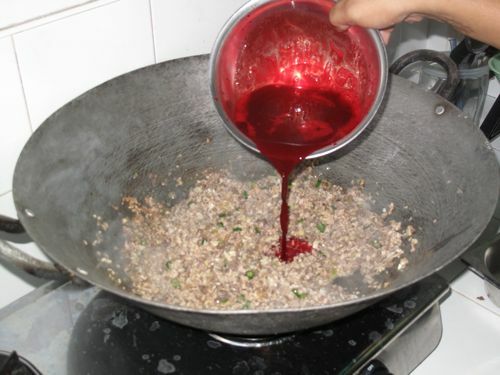 In our Cebu office, Victor is the recognized dinuguan or dugo-dugo expert, and this is how he made his version. Into a large kawali over a high flame, Victor added about 3 tablespoons of homemade lard. 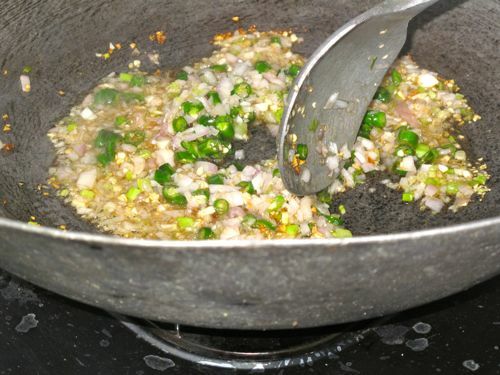 He then sauteed finely minced garlic, waiting for it to turn golden before adding the minced white onions, and white part of green onions. He then added some chopped green chilies (which turned out to be much milder than we all expected) and sauteed this all until softened. He then added half of the blanched then minced innards (excluding the liver) and cooked this for several minutes. 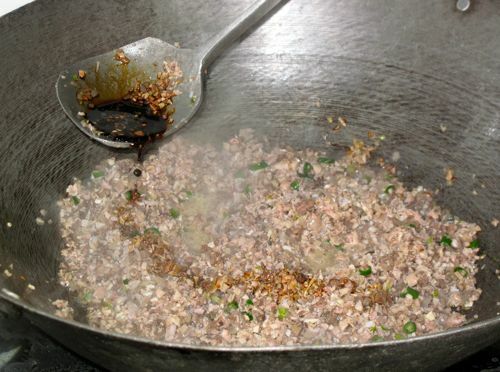 A couple of tablespoons of soy sauce, some bay leaves and some freshly cracked black pepper were also added in. I’m excited for your version MM! This is quite different, the innards are minced. someday i will add that “crispy” twist to the dinuguan usually made here by the cook. our cook usually adds pineapple tidbits and it tastes delicious. also, the liver isn’t included and only the coarsely chopped intestines are added as “meat.” i’m getting hungry. Your willpower must be godlike. On a diet and then cooking dinuguan, the craving for rice would be overwhelming for me. 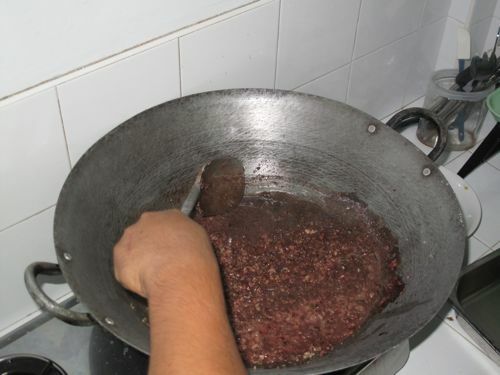 I love dinuguan – whether with puto or rice. I am used to (and prefer) the liver-less Cebu-style as opposed to the slightly sweeter blend I typically taste here in Manila. 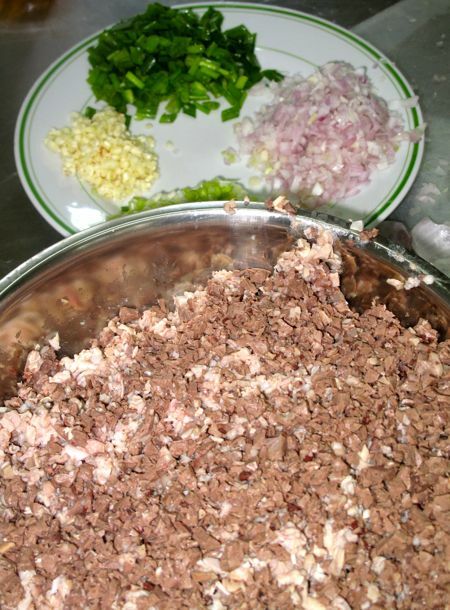 I prfer mine spicy, so I would usually crush up some sili then mix it around the “chocolate soup” – or if there are whole siling mahaba, I would eat that along with the “meat”. awwww dinuguan without rice or puto is just… incomplete! I can smell it from here!!! YUM! I ate a version of a friend that had Gabi and Gata on it, probably because he is from the Bicol region. It was weird but it was all good, but the best one was from my Tita and I guess the thing that makes this dish tasty is the part of putting tanglad in the blood… it’s the thing that made it special and delicious… It does matter. I haven’t tried dinuguan with tanglad, scallions & ginger.I will try making Victors dinuguan one of these days. Both interesting statements and makes me appreciate dinuguan even more. 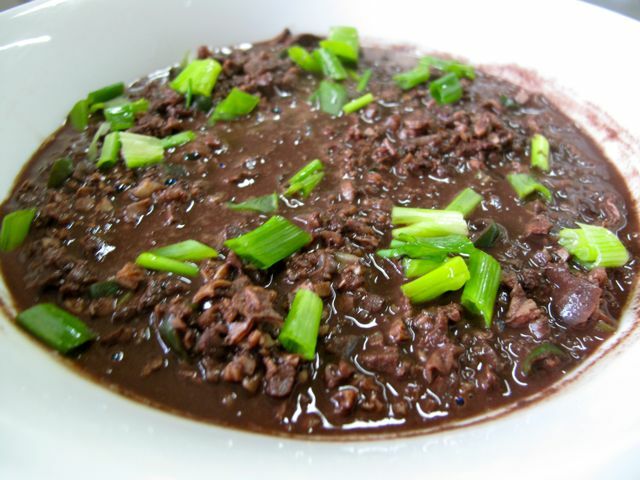 i love dinuguan, whatever style it is cooked…so pinoy! dinuguan is my favorite fare in town fiestas in Bohol where they prepare the innards minced and the end product had thick blood sauce compared to luzon versions. My mom said that in the olden days, dinuguan was not served to the VIP’s and it was impolite to do so probably because as you said this was for the ‘back of the house’. My dad’s Quezon/Bicolano version uses rendered fat to brown the innards. It is seasoned with soy sauce and vinegar then a couple stalks of lemon grass, generous amounts of siling haba and of course coconut milk (kakang gata) mixed with the blood. He also adds unripe jackfruit. IF THERE’S DINUGUAN (LIEMPO, PUSO, BAGA, ATAY, BITUKA, DUGO …), MIGHT AS WELL MAKE A BATCH OF KILAWIN (SAME INGREDIENTS, JUST WITHOUT THE DUGO). 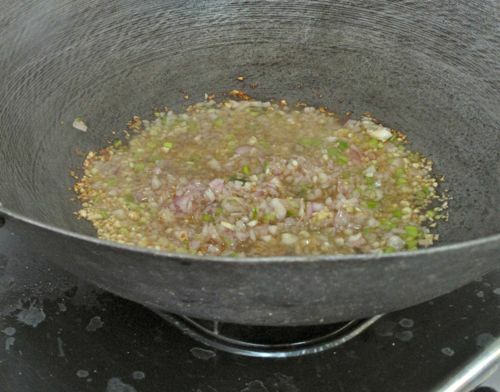 EVOO, GARLIC, ONION, SILING MAHABA, SALT, PEPPER, AND VERY GOOD VINEGAR FOR THE BOTH OF THEM.